Although the aforementioned literature provides descriptions of, and critical insights into, the types of challenges faced when couples are separated by imprisonment, this information was gathered largely through qualitative methods such as interviews and focus groups with small, nonrepresentative samples. These methods provide rich descriptions useful for informing public policy; however, more quantitative (and qualitative) research is needed using large, random samples of men in federal and state prisons and their partners in the community. 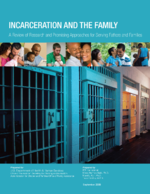 These studies should use standardized measures to assess the degree to which prisoners (and their partners) differ from the general population in characteristics relevant to family life and well-being. Research involving couples from different racial/ethnic groups is important to inform culturally competent interventions and policies. Moreover, longitudinal research that follows individuals and their partners over time is critically needed. Prospective research will allow us to make causal inferences about the effects of the prison experience on the couple relationship. We are currently hindered from identifying any cause-and-effect relationships because of the correlational nature of the available data.